Céline is a psychologist who specializes in military PTSD and police resilience. She recently wrote a book explaining the what and how of PTSD and cites meditation as an essential resource. Here’s why it is something she warmly recommends to all of her patients. PTSD is about being stuck in high gear, physiologically. Meditation fits in at the first stage of therapy, just as the person is learning about their symptoms. The first task is to discover how to downshift and get some control over their mind and nervous system before they can begin the hard part of therapy, which means reliving the worst time of their life. Guided meditation is a way to go back in with someone holding their hand, the first step to taking back their turf. People with anxiety do not know or believe that they can actually direct their thinking. Their experience is the exact opposite: their trauma memories or their worries about the future constantly hijack their conscious mind. With PTSD, the mind is stuck on repeat because it is trying to process an awful thing that happened, but it is not being successful. The constant reliving and the hyperarousal are immensely painful; you feel like you have lost control of you. Those suffering from PTSD behave as if their mind is a strange and dangerous neighbourhood; they spend as little time there as possible. Guided meditation is a way to go back in with someone holding their hand, the first step to taking back their turf. I think in metaphors and so I believe that the use of metaphors is an excellent approach to helping people understand meditation. We can all relate to the image of our minds “being dragged from here to there”, “like a dog on a leash”, or behaving like a “herd of sheep that need to be collected in a nice corner, all together in the body”. I tell my patients that happiness is determined by where you allocate your attention, that attention is a spotlight that is under your control, and that meditation is training in directing this spotlight. I’m aware that mindfulness is everywhere now, including psychology, but I’m still amazed at how well the messages — especially around emotional management and positive mindset training — fit with modern psychotherapy. Cognitive Behavioural Therapy (CBT) says that thoughts lead to feelings, and so you can use this connection to change how you feel. How cool to try meditation and discover how dropping the story you tell yourself causes your sadness or anger to dissolve. Meditation has a place in prevention also. It’s a wonderful time to be doing this work. People in high-risk jobs are now open to learning techniques of “arousal control” like breathing and meditation to help them be more resilient. With that said, meditation can be a hard sell with police officers and soldiers. One hint of condescension or of a hypnotizing tone of voice and they are gone in a puff of smoke. I’m the same. What works is treating it like training. First responders will try meditation if they can see it as an important self-control skill that requires practice, just like the skills for their job. If you are leading someone in a guided meditation, it helps to explain what you are trying to do in clear language and a friendly, non-intimidating style. It is so crucial that you don’t talk down and that you speak respectfully like a friend would, just one intelligent person talking to another. 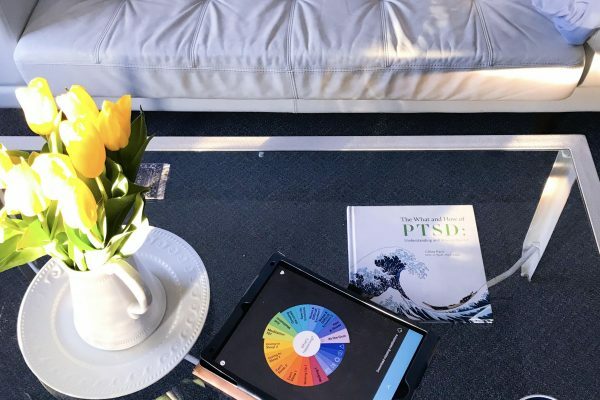 Céline Paris is the author of The What and How of PTSD: Understanding and Moving Beyond. Some of her favourite tracks are Rain (Stress & Difficult Emotion 1), Releasing (Going to Sleep 1), and Fluid (Stress & Difficult Emotion 2). If you feel you have learnt something important through your meditation practice and you’d like your share your insight or experience, we’d love to hear from you. Let us know via [email protected] and we’ll be in touch.